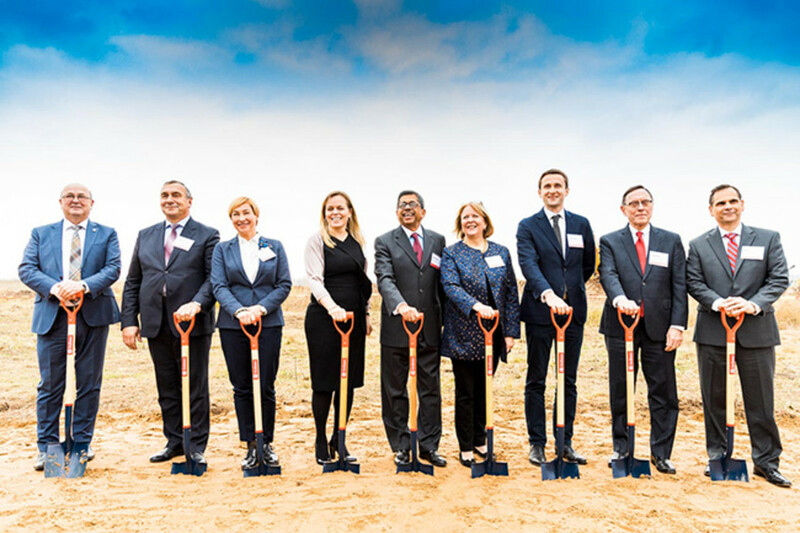 Hollister Incorporated, a global medical device manufacturer, today held a groundbreaking ceremony signifying the start of construction on a manufacturing plant in the Kaunas FEZ (Free Economic Zone) region of Lithuania. The multi-stage project represents a company investment of over $58 million (€50 million) and is expected to create more than 300 jobs over the next several years. Upon opening in mid-2019, the new plant will produce ostomy-care products with plans to expand production to include continence-care products. The groundbreaking ceremony and reception were attended by: Hollister Incorporated President and CEO George Maliekel; Senior VP of Research & Development and Global Operations James Humphries; VP Human Resources Suzanne Erickson; VP and CFO Rob Keeley; VP of Global Operations Brendan Sugrue; and Senior Director Global Manufacturing William Ciehanski. The skills and talent of the local population were critical components in making the decision to build the new facility in Lithuania. The cultural ‘fit’ between the company’s culture and the people throughout the region were also extremely important. Educational opportunities were a significant factor as well. That is why Hollister Incorporated is committed to working closely with local educational institutions, like the Kaunas University of Technology and the Lithuanian University of Health Sciences, as well as institutions across the country to help enhance programs in research, engineering and technology to develop exceptional graduates and further strengthen the local talent market. The company has already hired a few engineers from Lithuania who will begin working at its Ballina, Ireland plant. They will return to the Kaunas plant after the first phase of construction is completed in 2019. Hollister Incorporated is an independent, employee-owned company that develops, manufactures, and markets healthcare products worldwide. The company develops and manufactures products for ostomy care, continence care and wound care, and also develops educational support materials for patients and healthcare professionals. Hollister Incorporated has been serving healthcare professionals and consumers for 95 years and is committed to making life more rewarding and dignified for people who use its products and services. Headquartered in Libertyville, Illinois, Hollister has manufacturing and distribution centers on three continents and sells in more than 80 countries around the world. Hollister Incorporated is dedicated to improving the experience of anyone with an ostomy.